The Roundhouse was built for the London and Birmingham Railway as a turntable engine shed (which is where the venue derives its name). The site was transferred to Centre 42 in 1964, where the organisation began to convert the build into a cultural centre. It became an arts venue in 1966, playing hosts to a wide variety of bands including David Bowie, Jeff Beck, The Clash, and Jimi Hendrix. In 1983, after the building passed to the Camden London Borough Council, the Roundhouse closed due to lack of funds. The Norman Trust purchased it in 1996, with the Roundhouse Trust being set up two years later. The venue reopened for two-years to raise awareness for its redevelopment scheme. 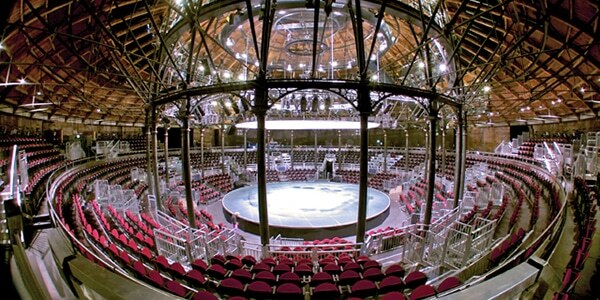 Following a £27 million renovation, the Roundhouse reopened on 1st June 2006. The venue today hosts theatre, live music (contemporary and classical), dance, and club nights. The venue offers a multitude of opportunities for young people, offering a range of workshops, training, performances, masterclasses, and holidays projects to people aged 11-25.